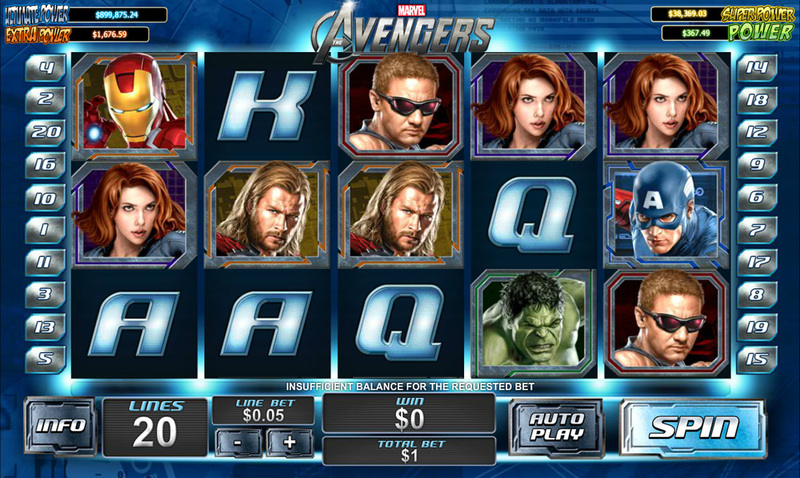 The Avengers is one of Playtech’s newer Marvel progressive jackpot slots. Based on the popular 2012 movie, this new slot has four different types of free spins and four different levels of progressive jackpots to be won. Captain America, Iron Man, Thor and The Incredible Hulk are some of the better paying symbols in this game. Captain America is the best paying standard icon you can acquire, being worth a total of 1000 coins if 5 of them land on an active payline. In order to place their stake, gamers must click on the line bet button. This will adjust their bet to anything from 1c up to $5 per line. There are a total of 20 paylines spread over the 5 reels this video slot has to offer, and that means minimum and maximum wagers vary from just 1c per spin, up to a total of $100 per spin. The Shield symbol is wild in this game. It can substitute itself for all other icons in the title, with the scatter icon being exempt of course. It can also offer a top non-progressive pay-out of 10,000 coins if 5 land on an active payline. The scatter icon is the Avengers logo, and 3 or more of them landing anywhere on the reels will trigger The Wall of Heroes Bonus. Players will also pick up scatter wins of 3x, 10x, or 100x their stake for 3, 4 or 5 of the scatters. Play The Avengers now at Casino.com! 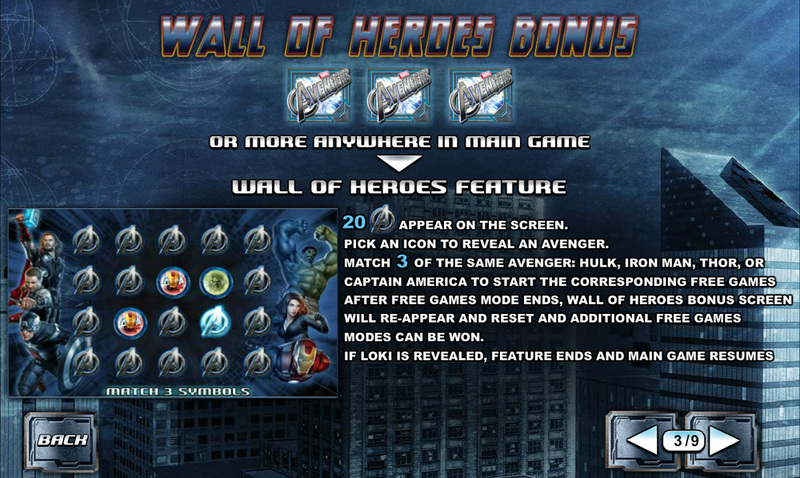 In the Wall of Heroes Bonus, 20 Avengers logos will appear on the screen. The player must then pick the symbols, until they have matched 3 of the same super hero. When this happens, the bonus screen goes away, and the corresponding free spins round begins. At the end of the free spins round, players are sent back to the Wall of Heroes for another set of picks. If Loki is revealed, the bonus ends and players are returned to the main game. 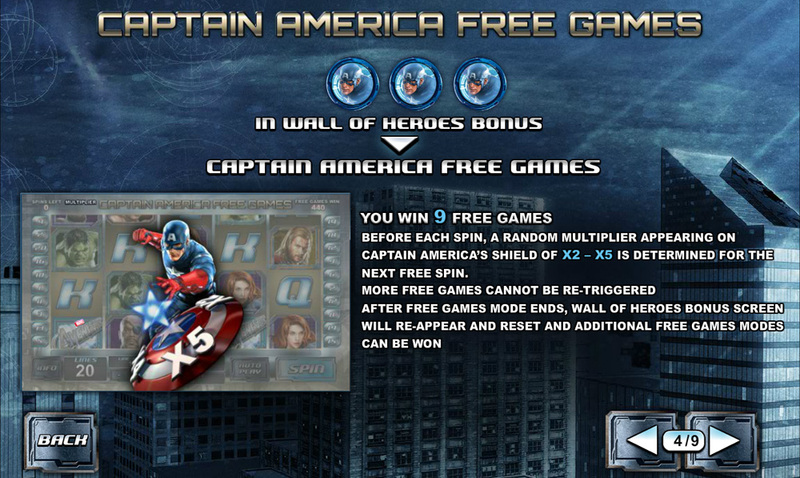 In the Captain America free games, the player wins 9 free spins with a 2x-5x multiplier. 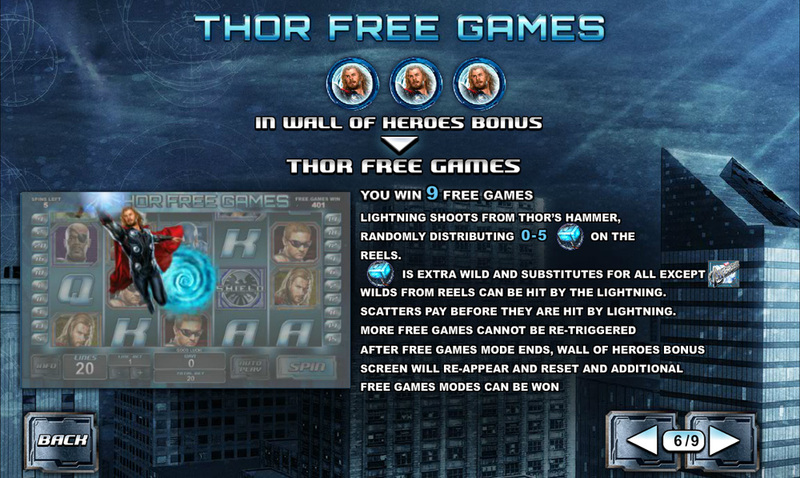 The Thor free games sees players land 9 free games with Thor’s Hammer shooting lightning at the symbols on each spin, adding 0-5 wilds anywhere on the reels. 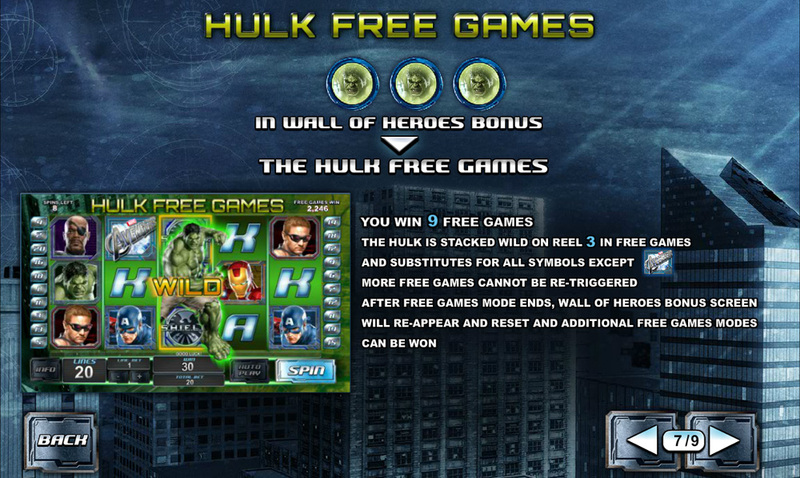 In the Hulk free games round, players get 9 free games with the third reel always being wild. 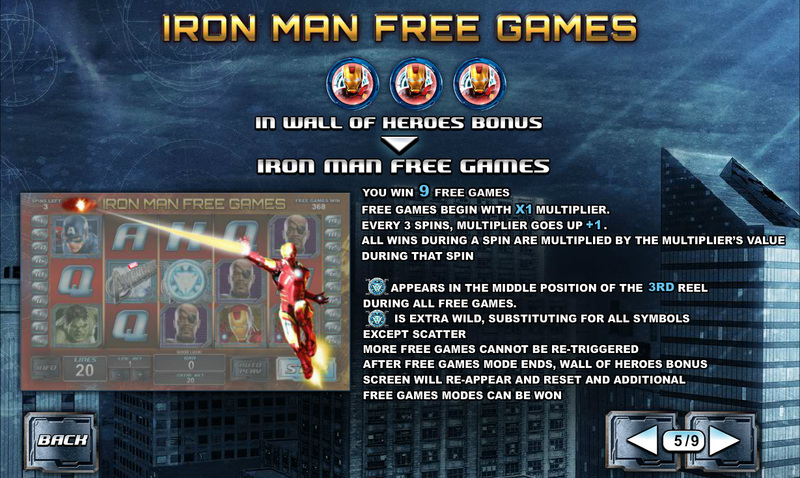 The Iron Man free games gives the player 9 free spins with an increasing multiplier and an extra wild symbol on the middle of the third reel during the feature. The player can also trigger a 200x line bet bonus, if they manage to assemble all of the different heroes of The Avengers on any active payline. This is known as The Avengers Assemble bonus. There are four progressive jackpots to win in this slot, which are randomly triggered. The Power, Extra Power, Super Power and Ultimate Power progressive jackpots can only be won when the player is taken randomly to a second screen, where they can pick from a series of icons, which will reveal what jackpot they have won. Any spin of any bet size can trigger the progressive round, and once in there, you are guaranteed to win one the four jackpots. You can find The Avengers at any of these trusted Playtech Casinos.